We'd prefer to answer your questions via email, as it allows us to continue to work hard on our customer's projects. The fastest way to communicate with our customer support! Once you click the button above, your message will be sent to our customer support immediately. You may receive a response from our representative within 48 hours. 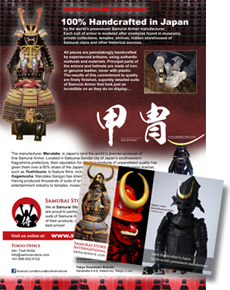 You can also email us at info@samurai-store.com directly via any email application. Attached file should be only jpg, gif, png and pdf formats. Please provide the shipping address in Message field to receive a free flyers from us!